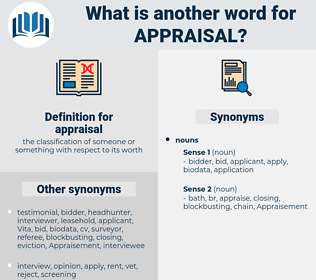 What is another word for appraisal? assess, Assessing, evaluating, needs-assessment, discretionary. evaluators, Criteria, assess, assesses, Gains, results, Assessing, appreciation, evaluating, appraise. assess, re-evaluation, reassessment, Assessing, appreciation, evaluator, discretion, appraiser, revaluation, audits, praise. Praised, Commended, Rated, Commented, appreciation. 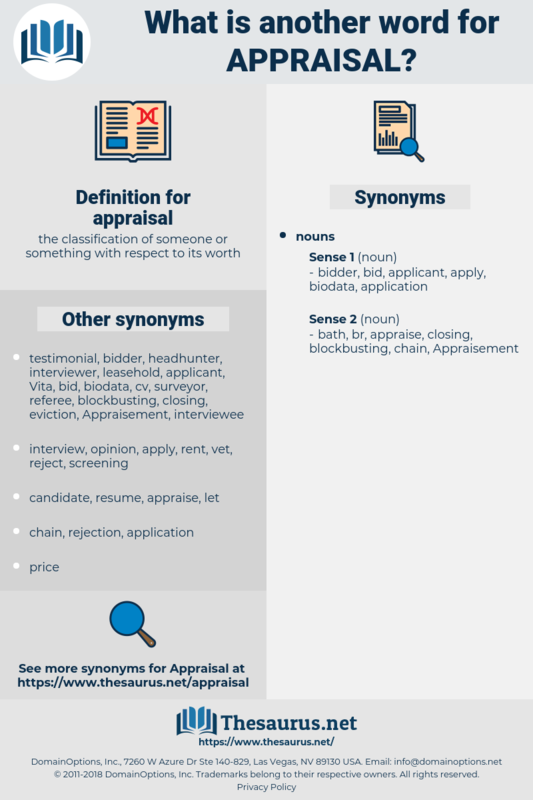 check, assay, reappraisal, critical analysis, revaluation, critical appraisal, rating, evaluation, review, valuation, underevaluation, reassessment, acid test.